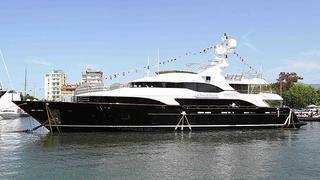 New to Northrop & Johnson's charter fleet is the recently launched 44 metre Benetti Vision motor yacht Checkmate, which is available in the Mediterranean this summer and heading for the Caribbean and Bahamas in the winter. Checkmate accommodates up to 12 guests in five cabins, including a main deck master suite with 180 degree panoramic views and natural light from large windows - a feature of all the lower deck double guest cabins. Francois Zuretti has designed a 'contemporary chic' interior using a mix of cherrywood, burr madrona and Italian marbles. Amongst her spacious guest areas the bridge deck skylounge stands out with its aft sliding doors that open 270 degrees for a sublime al fresco dining experience. Zero speed stabilisers ensure constant comfort for guests even at anchor. Checkmate has an impressively sized sun deck with its own dayhead - a first for this series - and an array of water toys to entertain her guests. She is also 'dialed in' with VSAT constant Internet. Charter rates for the Mediterranean start at $225,000 per week plus expenses, while for the Caribbean it is $200,000 per week plus expenses.